Vishal Mangalwadi's book is a fascinating read! 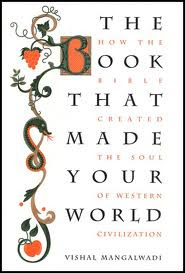 This book is a survey of how the West (and really the world itself) was greatly shaped by the Bible and Christianity. TBTMYW serves as a great reminder that in order for God to continue to bless America, we must return to the basic principles of faith, hope and charity. I couldn't put the book down. Mangalwadi's knowledge of culture, history and Scripture is magnificent! He truly is "India's foremost Christian intellectual." Prologue: Why This Journey into the Soul of the Modern World? 2. Service: Or a Ticket or Jail? 3. Quest: Can Blind Men Know the Elephant? 4. Self: Am I Like a Dog or God? 5. Humanity: What is the West's Greatest Discovery? 6. Rationality: What Made the West a Thinking Civilization? 7. Technology: Why Did Monks Develop It? 8. Heroism: How Did A Defeated Messiah Conquer Rome? 9. Revolution: What Made Translators World Changers? 10. Languages: How Was Intellectual Power Democratized? 11. Literature: Why Did Pilgrims Build Nations? 12. University: Why Educate Your Subjects? 13. Science: What Is Its Source? Part VI: What Made the West the Best? 14. Morality: What Are Some Less Corrupt? 15. Family: Why Did America Surge Ahead of Europe? 16. Compassion: Why Did Caring Become Medical Commitment? 17. True Wealth: How Did Stewardship Become Spirituality? 18. Liberty: Why Did Fundamentalism Produce Freedom? 19. Mission: Can Stone Age Tribes Help Globalization? 20. The Future: Must the Sun Set on the West? Appendix: The Bible: Is It a Fax from Heaven? Published by Thomas Nelson, (C) 2011, Soft cover, 442 pages of good reading.